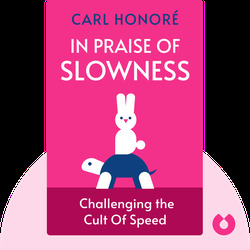 In Praise of Slowness (2005) offers both an indictment of and an alternative to the high-speed lifestyle that plagues many people today. It examines how the rat race impacts our minds, bodies and souls – and offers concrete tips on how to slow things down. Carl Honoré is an award-winning journalist, author and TED speaker. In addition to articles published in the Economist, the Houston Chronicle and the Miami Herald, he’s written two other books, including The Slow Fix.